It's been a busy, busy summer. When I'm not creating wedding flowers for Lilac and Lily, from time to time I work as a freelance florist for a large event company and over the past couple of months I've been lucky enough to work at some fabulous high profile events including Wimbledon and the Cartier International Day at the Guards Polo Club. Then last weekend it was down to London for the wedding of Georgina and John. 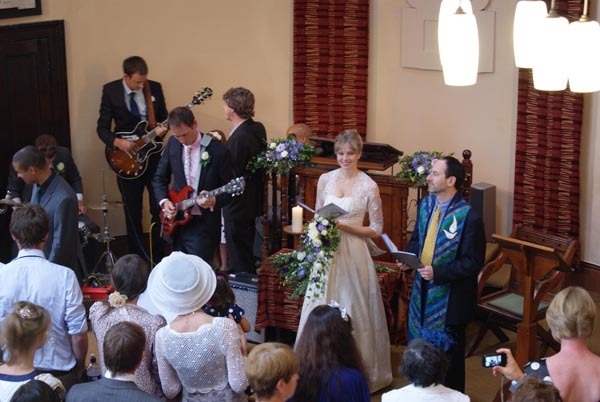 The bride was gorgeous and the church ceremony featured a guitar strumming groom and an MC leading the congregation in a rendition of Elvis's 'Fools Rush In' - there was hardly a dry eye in the house. Georgina was an absolute dream to work with as she pretty much gave me a free rein with the flowers. I can't wait to share the pictures with you. Here's a little sneak preview. But for now I'm looking forward to a couple of weeks off. We are heading off to France where we'll be unwinding in the Loire before spending a few days in Paris. I'll leave you with this picture of the achingly romantic Jardins de Marqueyssac in the Dordogne which we visited on our last trip to France a couple of years ago. I'll be back in a couple of weeks and ready to share lots of lovely wedding flower pictures (and maybe the odd holiday snap or two as well).